Sixty-six million years ago Earth underwent a cataclysmic change. Back then, our planet was dominated by dinosaurs, but a mass extinction event hastened the demise of these huge reptiles and paved the way for the mammalian takeover. Though there is some debate as to whether the extinction of the dinosaurs was triggered by an isolated disaster or a series of disasters, one event is clear — Earth was hit by a massive comet or asteroid and its impact had global ramifications. The leading theory is that a massive comet slammed into our planet, creating the vast Chicxulub Crater buried under the Yucatán Peninsula in Mexico, enshrouding the atmosphere in fine debris, blotting out the sun for years. Although there is strong evidence of comet impacts on Earth, these deep space vagabonds are notoriously hard to track, let alone predict when or how often they may appear. All we know is that they are out there, there are more than we thought, they are known to hit planets in the solar system and they can wreak damage of apocalyptic proportions. Now, using fresh observations from the European Space Agency’s Gaia mission, astronomer Coryn Bailer-Jones, who works at the Max Planck Institute for Astronomy in Munich, Germany, has added an interesting component to our understanding of cometary behavior. Long-period comets are the most mysterious — and troubling — class of comet. They will often appear from nowhere, after falling from their distant gravitational perches, zoom through the inner solar system and disappear once more — often to be never seen again. Or they hit something on their way through. These icy bodies are the pristine left-overs of our solar system’s formation five billion years ago, hurled far beyond the orbits of the planets and into a region called the Oort Cloud. In the Oort Cloud these ancient masses have remained in relative calm far from the gravitational instabilities close to the sun. But over the eons, countless close approaches by other stars in our galactic neighborhood have occurred, causing very slight gravitational nudges to the Oort Cloud. Astronomers believe that such stellar encounters are responsible for knocking comets from this region, sending them on a roller-coaster ride to the inner solar system. The Gaia mission is a space telescope tasked with precisely mapping the distribution and motion of stars in our galaxy, so Bailer-Jones has investigated the rate of stellar encounters with our solar system. Using information in Gaia’s first data release (DR1), Bailer-Jones has published the first systematic estimate of stellar encounters — in other words, he’s estimated the flow of stellar traffic in the solar system’s neighborhood. And the traffic was found to be surprisingly heavy. In his study, to be published in the journal Astronomy & Astrophysics, Bailer-Jones estimates that, on average, between 490 and 600 stars will come within 16.3 light-years (5 parsecs) of our sun and 19-24 of them will come within 3.26 light-years (1 parsec) every million years. According to a press release, all of these stars will have some gravitational effect on the solar system’s Oort Cloud, though the closest encounters will have a greater influence. This first Gaia data release is valid for five million years into the past and into the future, but astronomers hope the next data release (DR2) will be able to estimate stellar traffic up to 25 million years into the past and future. To begin studying the stellar traffic that may have been responsible for destabilizing the dinosaur-killing comet that hit Earth 66 million years ago will require a better understanding of the mass distribution of our galaxy (and how it influences the motion of stars) — a long-term goal of the Gaia project. Spinning this idea into the future, could this project be used to act as an early warning system? Or could it be used to predict when and where a long-period comet may appear in the sky? He argues that the probability of comets being gravitationally nudged can be modeled statistically, but this would require a lot of assumptions to be made about the Oort Cloud, a region of space that we know very little about. Also, the Oort Cloud is located well beyond the sun’s heliosphere and is thought to be between 50,000 and 200,000 AU (astronomical units, where 1 AU is the average distance between the sun and the Earth) away, so it would take a long time for comets to travel from this region, creating a long lag-time between stellar close approach and the comet making an appearance. “Typically it takes a few million years for a comet to reach the inner solar system,” he added, also pointing out that other factors can complicate calculations, such as Jupiter’s enormous gravity that can deflect the passage of comets, or even fling them back out of the solar system again. This is a fascinating study that goes to show that gravitational perturbations in the Oort Cloud are far from being rare events. A surprisingly strong flow of stellar traffic will constantly rattle otherwise inert comets, but how many are dislodged and sent on the long journey to the solar system’s core remains a matter for statistics and probability. While Opportunity and Curiosity continue to explore the surface of Mars, the launch date of NASA’s next big rover mission is on the horizon. And here’s a stunning artist’s impression of the mission that NASA released on Tuesday. No. While the Mars 2020 rover will certainly look like Curiosity, as many of the current rover’s design features will be worked into NASA’s next six-wheeled robot, there will be some key differences in the next rover’s science. Rather than seeking out past and present habitable environments (as Curiosity is currently doing on the slopes of Mount Sharp), one of Mars 2020’s stated science goals is to directly search for biological signatures of past and present microbial life on Mars. This next-generation rover will also feature a drill that can bore deep into rocks, pull samples and store them on the Martian surface for a possible future sample return mission. For more on Mars 2020, check out NASA’s mission site. 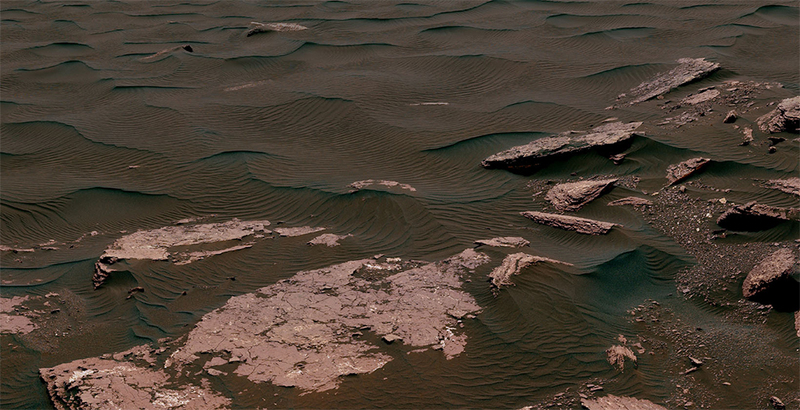 There are few sights on Mars more satisfying than its oddly familiar — yet weirdly alien — dunes. On the one hand, the Martian dunes look much like the dunes we have on Earth — aeolian (“wind-driven”) formations undulating across the landscape have similarities regardless of which planet they were blown on. But there’s something uncanny about Martian dunes. Maybe it’s the “extra” tiny ripples that NASA’s Curiosity itself discovered — a phenomenon that is exclusive to the Martian atmosphere. Or maybe it’s just that I know these dunes are being seen through synthetic eyes on a world millions of miles across the interplanetary void. But right now, the six-wheeled robot is sampling grains of wind-blown regolith from a linear dunes on the slopes of Mount Sharp to help planetary scientists on Earth build a picture of how this ancient landscape was shaped. All of the dunes Curiosity has sampled are a part of the Bagnold Dunes, a dune field that stretches up the northwestern flank of Mount Sharp. Within the field, depending on the wind conditions, different types of dunes have been found. It’s official, there’s a whole lot of nothing in Saturn’s innermost ring gap. This blunt — and slightly mysterious — conclusion was reached when scientists studied Cassini data after the spacecraft’s first dive through the gas giant’s ring plane. At first blush, this might not sound so surprising; the 1,200-mile-wide gap between Saturn’s upper atmosphere and the innermost edge of its rings does appear like an empty place. But as the NASA spacecraft barreled through the gap on April 26, mission scientists expected Cassini to hit a few stray particles on its way through. Instead, it hit nothing. Or, at least, far fewer particles than they predicted. Now that is what it sounds like to get smacked by a blizzard of tiny particles at high speed. From this first ring gap dive, NASA says Cassini likely only hit a handful of minute, 1 micron particles — particles no larger than those found in smoke. And that’s a bit weird. As weird as it may be, the fact that the region of Cassini’s first ring dive is emptier than expected now allows mission scientists to carry out optimized science operations with the spacecraft’s instruments. On the first pass, Cassini’s dish-shaped high-gain antenna was used as a shield to protect the spacecraft as it made the dive. On its next ring dive, which is scheduled for Tuesday at 12:38 p.m. PT (3:38 p.m. ET), this precaution is evidently not needed and the spacecraft will be oriented to better view the rings as it flies through. After all the excitement of last night’s Cassini mission checking in and transmitting data to NASA’s Deep Space Network, I joined Warren Olney on his NPR-syndicated show “To The Point” this morning to chat about the mission and why the “Grand Finale” is an awesome, yet bittersweet, part of Saturn exploration. Listen to the 10 minute segment here. It was great as always to chat with Warren, thanks for having me on the show! 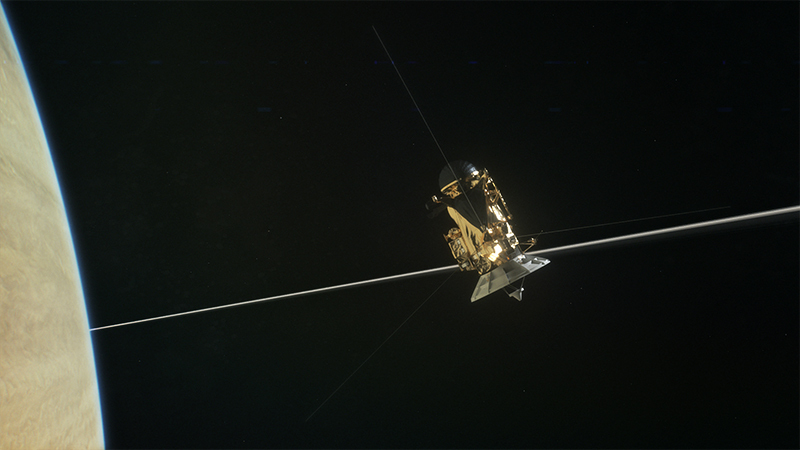 Original: As NASA planned, just before midnight on Wednesday (April 26), the veteran Cassini spacecraft made radio contact with the Goldstone 70-meter antenna in California, part of the Deep Space Network (DSN), which communicates with missions in space. Within minutes, Goldstone was receiving data, meaning the spacecraft had not only survived its first ring dive of the “Grand Finale” phase of its mission, but that it was also transmitting science data from a region of space that we’ve never explored before. “We did it! Cassini is in contact with Earth and sending back data after a successful dive through the gap between Saturn and its rings,” tweeted the official NASA Cassini account just after the DSN confirmed it was receiving telemetry. “The gap between Saturn and its rings is no longer unexplored space – and we’re going back 21 times,” they added. Around 22 hours prior to Cassini’s signal, the spacecraft made its daring transit through the gap between Saturn’s upper atmosphere and innermost ring after using the gravity of Titan on Friday (April 21) to send it on a ballistic trajectory through the ring plane. But during that time the spacecraft went silent, instead devoting resources to carrying out science observations during the dive. Of course there was much anticipation for Cassini to “phone home” tonight and it did just that right on schedule and now we can look forward to another 21 dives through Saturn’s rings before Cassini burns up in the gas giant’s upper atmosphere on Sept. 15, ending its epic 13 year mission at the solar system’s ringed planet. So now we wait until images of this never-before-explored region of Saturn are released. Read more about Cassini’s historic ring dive in my Space.com interview with Cassini deputy project scientist Scott Edgington. NASA’s Cassini mission sure has a knack for putting stuff into perspective — and this most recent view from Saturn orbit is no different. 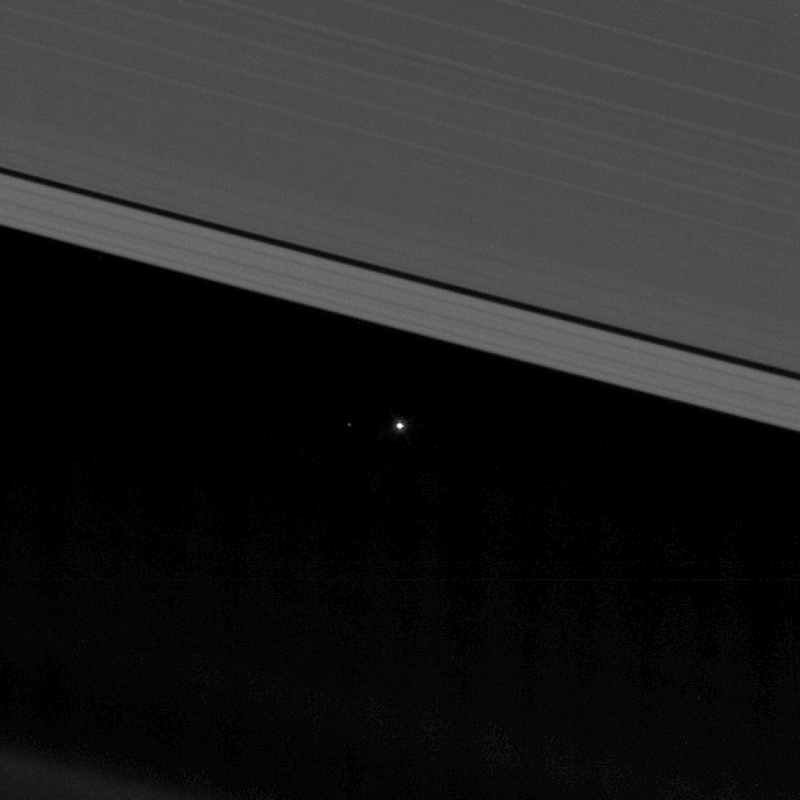 That dot in the center of the image isn’t a dud pixel in Cassini’s camera CCD. That’s us. All of us. Everyone. Sagan wrote that passage in his book “Pale Blue Dot: A Vision of the Human Future in Space” when reflecting on the famous “Pale Blue Dot” image that was beamed back to Earth by NASA’s Voyager 1 spacecraft in 1990. That’s when the mission returned a profound view of our planet from a distance of 3.7 billion miles (or 40.5AU) as it was traveling through the solar system’s hinterlands, on its way to interstellar space. Since then, there’s been many versions of pale blue dots snapped by the armada of robotic missions around the solar system and Cassini has looked back at us on several occasions from its orbital perch. Now, just before Cassini begins the final leg of its Saturnian odyssey, it has again spied Earth through a gap between the gas giant’s A ring (top) and F ring (bottom). In a cropped and enhanced version, our moon is even visible! The image is composed of many observations captured on April 12, stitched together as a mosaic when Saturn was 870 million miles (roughly 9.4AU) from Earth. On April 20 (Friday), Cassini will make its final flyby of Titan, Saturn’s largest moon, using its gravity to fling itself through Saturn’s ring plane (on April 26) between the innermost ring and the planet’s cloudy upper atmosphere, revealing a view that we’ve never before seen. For 22 orbits, Cassini will dive into this uncharted region, possibly revealing new things about Saturn’s evolution, what material its rings contain and incredibly intimate views of its atmosphere. This daring maneuver will signal the beginning of the end for this historic mission, however. On Sept. 15, Cassini will be intentionally steered into Saturn’s atmosphere to burn up as a human-made meteor. It is low in fuel, so NASA wants to avoid the spacecraft from crashing into and contaminating one of Saturn’s potentially life-giving moons — Titan or Enceladus. So, appreciate every image that is captured by Cassini over the coming weeks. The pictures will be like nothing we’ve seen before of the ringed gas giant, creating a very bittersweet phase of the spacecraft’s profound mission to Saturn.